"Scientists at NASA are keeping close tabs on two clouds of debris from Tuesday satellite collision to determine how much of a risk they pose to the agency's Earth-watching spacecraft and, possibly, the Hubble Space Telescope. The rare collision is unprecedented, marking the first time two intact satellites orbiting Earth have accidentally crashed into and obliterated one another, NASA officials said. The debris poses a greater risk to science satellites than to the International Space Station, which is currently home to two American astronauts and a Russian cosmonaut." "Before the latest incident, there were over 300,000 orbital objects measuring between 0.4 and four inches in diameter and "billions" of smaller pieces, according to a 2008 report by the Space Security Index, an international monitoring group. Traveling at speeds that can reach many thousands of miles per hour, the tiniest debris orbiting can damage or destroy a spacecraft. In June 1983, the windscreen of the US space shuttle Challenger had to be replaced after it was chipped by a fleck of paint measuring 0.01 of an inch that impacted at 2.5 miles per second." The U.S. Global Positioning System (GPS) is the only fully functional GNSS in the world and uses a constellation of between 24 and 32 satellites in Medium Earth Orbit (MEO). MEO is a region of space where satellites fly at an approximate altitude of 12,552 miles above Earth. 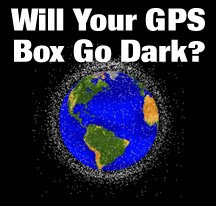 The two satellites that crashed NASCAR style were in Low Earth Orbit (LEO) at about 490 miles up, so the GPS constellation is well above the debris fields and therefore not in danger since gravity will continually pull the garbage back to Earth. Again, not a rocket scientist here, but I can figure things out pretty well. If the super-strong, heat resistent windscreen of a space shuttle can be damaged necessitating replacement just from contact with a piece of space junk the size of a fleck of paint...imagine what a titanium screw from one of the two crashed satellites would do if it comes through the living room window of the International Space Station, which orbits about 270 miles BELOW the debris fields. I have a funny feeling in my gut we haven't heard the last of this story. And the rumors out there on the Internets that this incident has prompted a world-wide outcry for a celestial "air traffic control" system is bunk, I am sure. But it would be fun to liquor up a couple of off-duty NATCA members and see how they'd go about keeping satellites, space junk, the ISS and whatever replaces the Space shuttle separated in space.